While googling around looking for advertising posters for Asian airlines of the 20’s and 30’s I found this. It is from a series of prints showing the Japanese expedition to Siberia in during the Russian Revolution.1. I of course found the plane interesting. What the heck is that thing? I am not much of a plane spotter, so I guess maybe it actually existed. More likely, however, it is a fantasy plane that was made up by the illustrator. This would not be the first time that an illustrator just made something up, rather than doing the research. 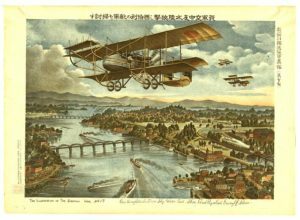 Given how uncommon planes were in Japan in 1919, it is not event that surprising that he came up with something pretty fantastic, although I expect he could have found a picture of one. Still, this one is instructive. Aviation was supposed to change the world. They would make war unthinkable or make armies and navies obsolete as all fighting moved to the air. This did not work out quite as predicted (Where’s my flying car?) but the idea that miraculous machines would dominate the world just by flying over it was common with westerners from H.G. Wells to Charles Lindbergh. From the evidence of this picture plenty of Japanese people thought so too even before Hayao Miyazaki came along.